What type of spider is this and what is the risk? A brown widow spider will usually hide when it senses danger. In fact, a person is more likely to be hit by lightning than be bitten by a brown or black widow spider. Image credit: Nancy Hinkle. Glove up before clearing brush, cleaning out the garage or pulling logs off the woodpile this winter. A brown widow spider or her more commonly known sister, the black widow, may be hiding in the shadows. The brown widow’s camouflage – an orange hourglass on a brown body – makes her hard to see. That’s good for her but bad for the person who sticks a hand too close to her web. The brown widow usually tries to stay away from people, said Whitney Boozer, an entomology graduate student with the University of Georgia College of Agricultural and Environmental Sciences. “If they’re disturbed, they drop off the web, curl up in a ball or retreat,” Boozer said. They can’t retreat when they’re pressed up against someone’s skin, though. A brown widow gets in this situation when someone wraps a hand around her while she’s holed up some place. Gloves and long sleeves will protect you “if you’re working in areas where brown widow spiders are commonly found,” Boozer said. Outside, brown widows prefer woodpiles, tires, empty containers and eaves. Indoors, the spider prefers protected places like under furniture and in shoes. Shake clothes and check shoes before putting them on if they are left outside or in a garage. Bites by brown widows cause severe reactions in 5 percent of people who are bitten. The young and old are especially vulnerable. With medical intervention, bites are almost never fatal. The only scientific data collected on deaths attributed to widow spiders was taken between 1950 and 1959. During that time, 63 people died from the spiders’ bites, said Nancy Hinkle, a CAES entomologist. “Doubtless those numbers are much lower now that we have indoor plumbing because most widow bites occurred in privies,” she said. According to Boozer, the brown widow’s venom is more toxic than that of her black cousin, but she injects less venom when she bites. She estimates that there are fewer than seven people killed each year by widow spiders. More than 1,000 people each year are struck by lightning. “So your chance of being killed by a widow spider bite — even without treatment — is over 100 times less than your chance of being struck by lightning,” Hinkle said. 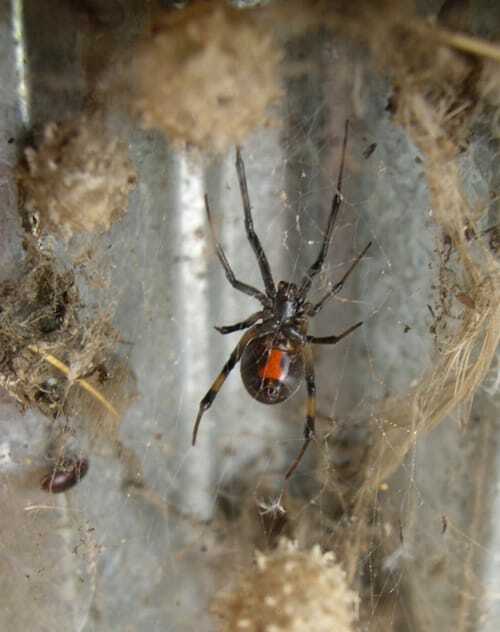 Despite the odds, brown widows still aren’t spiders most people want wandering around in their homes. If you do see one, don’t panic. Boozer suggests taking it outside or vacuuming it up. “Even outside, you’re allowed to kill widow spiders,” Hinkle said, who usually cringes when the conversation turns to smashing spiders. Crush the egg sack, too, Boozer said. A brown widow’s egg sack is sphere shaped with spindly spikes of webbing sticking up all over it. If desperation leads to a chemical attack, it’s best to spray spiders directly, Boozer said. Spraying a home’s perimeter may prevent spiders from entering it, but it won’t kill the ones already there. Brown widow spiders avoid places that have been sprayed.